WATERLOO – Christopher Alcantara, an associate professor of Political Science at Laurier, has been awarded the Canadian Studies Network’s Prize for the Best Book in Canadian Studies. 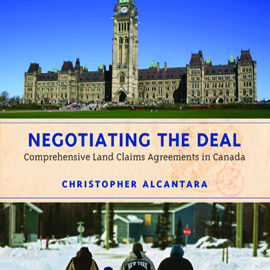 Alcantara received the prize for his book, Negotiating the Deal: Comprehensive Land Claims Agreements in Canada, published in March 2013. The Canadian Studies Network, an organization that supports the scholarly study of Canada, awards the Prize for the Best Book in Canadian Studies to an author or authors whose work on a Canadian subject best advances knowledge and understanding of Canada and Canadian Studies. Negotiating the Deal was recognized for presenting a fresh angle on an important Canadian topic: land claims treaties between Aboriginal groups and the federal, provincial and territorial governments of Canada. “It is a real honour, but also a big surprise, to have won this prestigious book prize,” said Alcantara. “Negotiating the Deal was a really hard book to write and eventually publish, given the many hurdles it faced over the years to finally see the light of day. In that sense, this award is really gratifying, especially because it was judged by a multidisciplinary adjudication committee." Alcantara’s book takes a comprehensive look at completed and incomplete treaty negotiations between Aboriginal groups and federal, provincial and territorial governments of Canada. Using an interdisciplinary approach combining history, political science, environmental science and law, Alcantara compares the experiences of the Kwanlin Dün First Nation (with a completed treaty) and the Kaska Nations (with incomplete negotiations) in Yukon Territory; and the Inuit, (completed treaty), and Innu, (incomplete negotiations) in Newfoundland and Labrador. Based on the experiences of these groups, Alcantara argues that scholars and policymakers need to pay greater attention to the institutional framework governing treaty negotiations and, most importantly, to the active role that Aboriginal groups play in these processes.